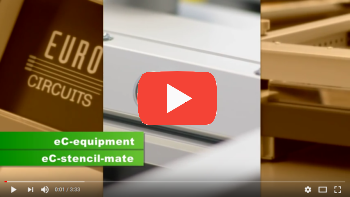 For added peace of mind now you can verify your PCB data prior to placing your order. 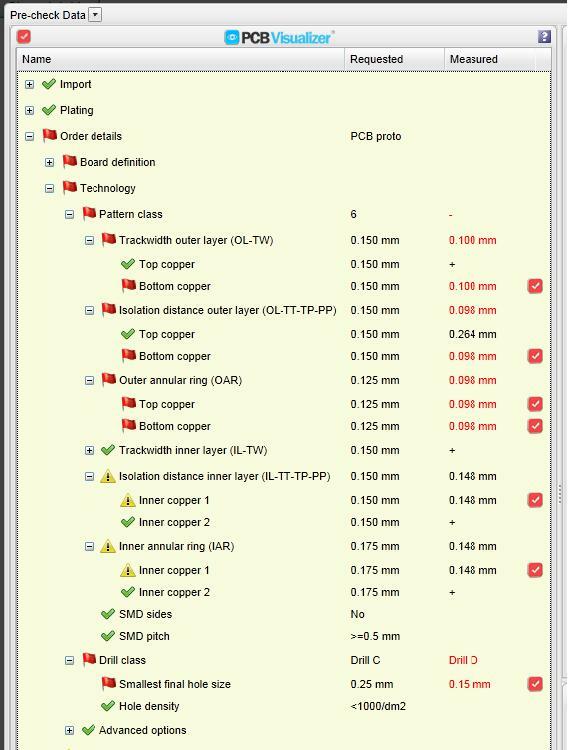 PCB Checker is part of the PCB Visualizer tool, an automatic tool for data inoput and manufacturability analysis. PCB Checker shows any design rule issue detected on your layout. The issues are shown on the board layout, as well as in detail with required and measured values. You can then fix them up front, helping to avoid delays to your time-critical deliveries. 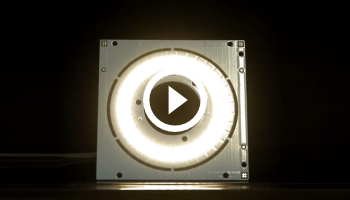 Upload your extended Gerber (RS274X) or Cadsoft EAGLE V6 files and let us surprise you. When data is prepared for the PCB Visualizer® application, a number of design rule checks are performed. These include trackwidth, isolation, annular ring and smallest final drill hole checks. The summary results of these checks are reported in the PCB Visualizer® window. Indicates an item which has passed our tests successfully. Indicates a non-critical issue you might want to review before you order. This usually indicates a small deviation from the requested values which can e.g. be caused by roundings during the conversion of the data. These issues will most probably be corrected during the preparation of the data for production. Indicates a critical issue and your attention is needed. 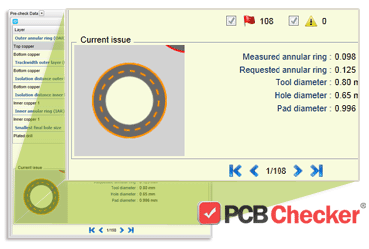 The PCB Checker® application can help to review the details of these reported issues and take the appropriate action. The PCB Checker® can be accessed by clicking the icon. This can be found at the top left corner of the PCB Visualizer window, or directly next to the measured values in the PCB Visualizer tree. The top part of the PCB Checker® window contains a list of all design rule checks that have reported issues. The issues are grouped per check. An entry is available for each relevant layer. The column reports the number of non-critical issues. The column reports the number of critical issues. 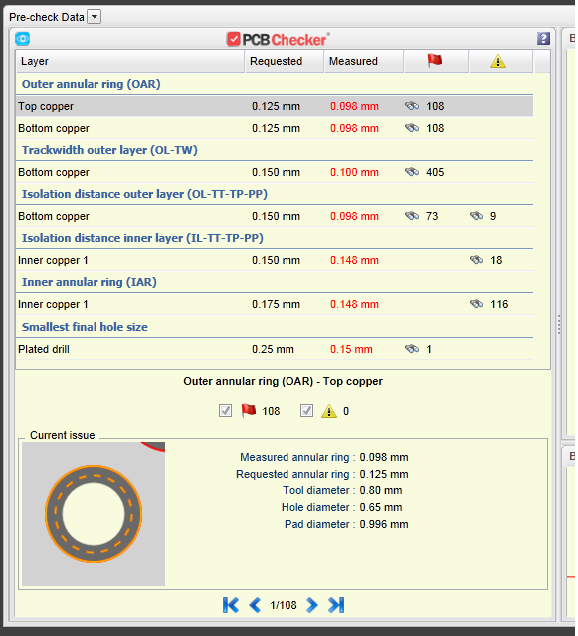 Clicking one of the rows will load the relevant issues in the issue browser at the bottom of the PCB Checker® window and will show the selected issues in the PCB image. Critical issues are shown in red, non-critical issues are shown in yellow. The displayed categories can be changed using the checkboxes at the top. With the browser at the bottom, each issue can be reviewed in detail. The Current issue window shows the detailed information of the current issue. 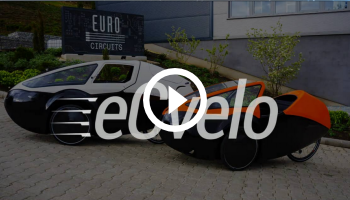 In the Detailed View window, the current issue is shown in orange and the image is automatically centered on the current issue. To go directly to an issue with a given number, click the current issue number (e.g. 1/108). A dialog box will come up to enter the issue number. Annular ring issues are shown as a set of concentric circles. The inner circle in background color shows the finished hole diameter. The dashed orange circle shows the tool diameter. The full orange circle shows the minimum available copper from the center of the drill hole. This is the tool diameter + the measured ring value. Trackwidth issues are shown as a full orange line, indicating the location where the trackwidth value has been measured. Isolation issues are shown as a full orange line, indicating the location where the isolation value has been measured. Smallest final hole size issues are shown by highlighting all drill holes with the offending diameter in the Detailed View window.